First of all, I'd like to take a moment to apologise for the quality of the photographs on my blog. I'm currently without a camera, as I sold my DSLR over summer to make some much needed money, so I'm afraid phone-quality & artificial light is the best I can do at the moment! Everybody with hair.. (especially those with dry/dyed hair).. listen up! Today I'm going to be talking about something which you may have heard of before - a method of washing your hair that uses just one product, really cheap conditioner. It's not as strange as you may think, and the results are astounding! The thought behind this process is that conditioner contains the ingredients necessary to clean your hair.. but without the damaging chemicals that strip away your hair's natural oils. The worst offenders for this are sulphates, but are L'Oreal's sulphate free products the answer? 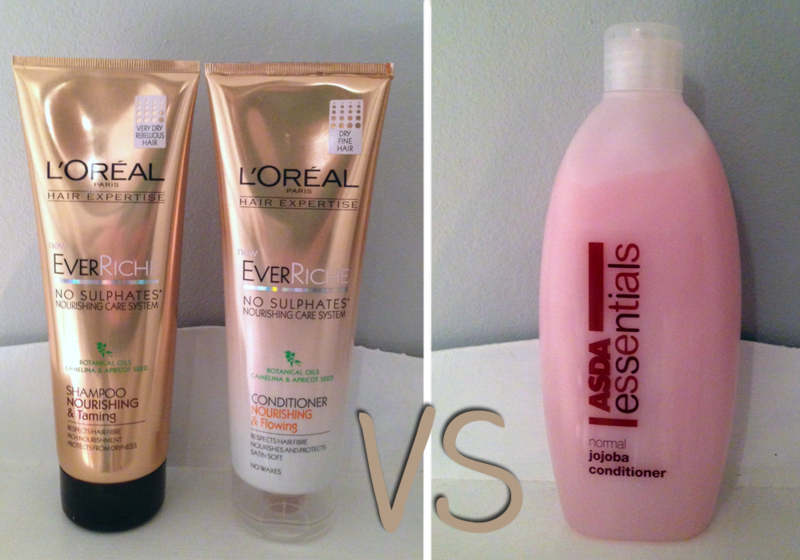 I'd been using L'Oreal's 'Ever Riche' range for months, and I absolutely loved it. However, when I looked at the ingredients on the back, I noticed some which looked very similar to the sneaky SLSs found in usual shampoos and conditioners, as well as a couple of silicones. Yes, my hair felt great, but I didn't feel so great about relying on mystery chemicals to clean my hair, and silicones to make it soft, and the price tag.. at almost £11 for a set of shampoo and conditioner.. well, read on and you'll see the competition! However, if you aren't keen on going CO, then this range is the next best thing, and I'd definitely recommend it. I decided that it was time I tried the CO method I'd heard so much about. I found a list of CO-recommended conditioners which can be viewed HERE, and decided to try out ASDA's Essential Jojoba Conditioner. Okay, so the bottle doesn't look as good in your bathroom, but don't let that put you off. The list of 10 ingredients on the back didn't worry me at all, as I knew what each one was for. With no silicones to weigh my hair down, or sulphates to dry it out, a pleasant fragrance and a price of only 80p for 500ml... well, if you're going to give this method a go, then this is the conditioner I'd recommend! I'd also highly recommend that you use a clarifying shampoo before beginning this method, to remove any build up of silicones, etc used in the past. I found that my hair took a little longer to dry than before, but I'm guessing that's just because it's retaining more moisture and natural oils. My curls are more pronounced (although I still straighten them away), and I can't see a single split end, which is absolutely unheard of for me! My hair feels so much stronger, and doesn't snap and break off when I brush it. Honestly, you wouldn't believe I'd bleached it twice this year! I have nothing but positive things to say about this method, and really would urge you to give it a go! I'm now almost on my third week of using this method, and I don't think I'm going to be stopping any time soon! I've also managed to get my boyfriend and another friend on board with it, and they're also experiencing fantastic results. I'd just like to also point out that surprisingly my hair hasn't been more oily than usual at all (which was my main concern before I began), and I can go 2-3 days without washing it, which is fantastic! This sounds really interesting! I may have to give it a go, my hair could do with some softening. Thank you, and yes - absolutely! I'll have a little look at them, I was planning to look at the Burt's Bees range as well, as they are also SLS free, and 99%+ natural. Absolutely, if anything, the cheaper brands are better because of the smaller ingredient lists! They may not make your hair so silky, but that's down to the lack of silicones. Great review, I did not this about L'oreal!